Exegesis of Vespers readings on Transfiguration: typology and moral instruction. 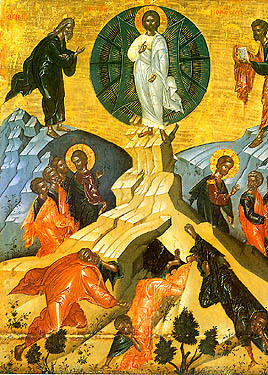 Synopsis: Exegesis of the Vespers readings (parables, paremia) for the Feast of the Transfiguration, with emphasis on typology, especially comparing the Theophanies Moses and Elijah experienced to the Transfiguration on Mount Tabor, and the significant moral instruction these events give us, when viewed in a Christian light. Exodus 24:12-18 12 And the Lord said to Moses: Come up to me into the mount, and be there: and I will give thee tables of stone, and the law, and the commandments which I have written: that thou mayst teach them. 13 Moses rose up, and his minister Josue: and Moses going up into the mount of God, 14 Said to the ancients: Wait ye here till we return to you. You have Aaron and Hur with you: if any question shall arise, you shall refer it to them. 15 And when Moses was gone up, a cloud covered the mount. 16 And the glory of the Lord dwelt upon Sinai, covering it with a cloud six days: and the seventh day he called him out of the midst of the cloud. 17 And the sight of the glory of the Lord was like a burning fire upon the top of the mount, in the eyes of the children of Israel. 18 And Moses, entering into the midst of the cloud, went up into the mountain: and he was there forty days, and forty nights. 1 Kings 19:3-9, 11-13, 15-16 3 Then Elias was afraid, and rising up he went whithersoever he had a mind: and he came to Bersabee of Juda, and left his servant there, 4 And he went forward, one day's journey into the desert. And when he was there, and sat under a juniper tree, he requested for his soul that he might die, and said: It is enough for me, Lord, take away my soul: for I am no better than my fathers. 5 And he cast himself down, end slept in the shadow of the juniper tree: and behold an angel of the Lord touched him, and said to him: Arise and eat. 6 He looked, and behold there was at his head a hearth cake, and a vessel of water: and he ate and drank, and he fell asleep again. 7 And the angel of the Lord came again the second time, and touched him, and said to him: Arise, eat: for thou hast yet a great way to go. 8 And he arose, and ate, and drank, and walked in the strength of that food forty days and forty nights, unto the mount of God, Horeb. 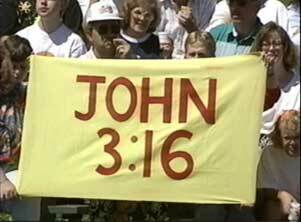 9 And when he was come thither, he abode in a cave: and behold the word of the Lord came unto him, and he said to him: What dost thou here, Elias? 11 And he said to him: Go forth, and stand upon the mount before the Lord: and behold the Lord passeth, and a great and strong wind before the Lord over throwing the mountains, and breaking the rocks in pieces: the Lord is not in the wind, and after the wind an earthquake: the Lord is not in the earthquake. 12 And after the earthquake a fire: the Lord is not in the fire, and after the fire a whistling of a gentle air. 13 And when Elias heard it, he covered his face with his mantle, and coming forth stood in the entering in of the cave, and behold a voice unto him, saying: What dost thou here, Elias? And he answered: 15 And the Lord said to him: Go, and return on thy way through the desert to Damascus: and when thou art come thither, thou shalt anoint Hazael to be king over Syria. 16 And thou shalt anoint Jehu the son of Namsi to be king over Israel: and Eliseus the son of Saphat, of Abelmeula, thou shalt anoint to be prophet in thy room. Old for the new but still new for the old since we are in the post-festival period of the Transfiguration, this short homily highlights something we must keep in mind every day. Synopsis: The most important aspect of the Transfiguration of our Lord on Mount Tabor is that it is a harbinger of things to come. The apostles were not ready to be in the presence of the divine uncreated light of God, and yet in the end we all will be in His presence. What must we do to become ready? The aposticha for the forefeast teaches us: "Illumined with the effulgence of the virtues, let us proceed to the holy mountain, that we may behold the divine Transfiguration of the Lord." 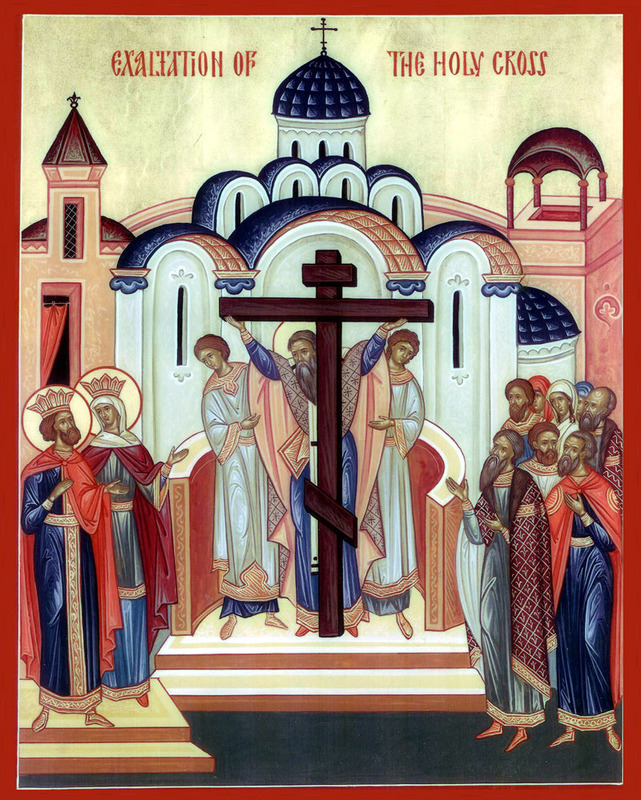 (Vespers Aposticha, August 5, Forefeast of the Transfiguration). Let us look at what happened to the apostles and why and what we must do as the aposticha teaches. Synopsis:Old for the new, but still new for the old since we are in the midst of the after-feast for transfiguration, the Parables at Transfiguration Vespers are important to understand. Similar events to the Transfiguration of Jesus Christ occurred in the Old Testament. Three selections from the Old Testament are read during the Vespers, involving Moses twice and also the Prophet Elijah. These parables are briefly explained. Exodus 24:12-1812 And the LORD said unto Moses, Come up to me into the mount, and be there: and I will give thee tables of stone, and a law, and commandments which I have written; that thou mayest teach them. 13 And Moses rose up, and his minister Joshua: and Moses went up into the mount of God. 14 And he said unto the elders, Tarry ye here for us, until we come again unto you: and, behold, Aaron and Hur are with you: if any man have any matters to do, let him come unto them. 15 And Moses went up into the mount, and a cloud covered the mount. 16 And the glory of the LORD abode upon mount Sinai, and the cloud covered it six days: and the seventh day he called unto Moses out of the midst of the cloud. 17 And the sight of the glory of the LORD was like devouring fire on the top of the mount in the eyes of the children of Israel. 18 And Moses went into the midst of the cloud, and gat him up into the mount: and Moses was in the mount forty days and forty nights. Exodus 33:11-23; 34:4-6, 8 11 And the LORD spake unto Moses face to face, as a man speaketh unto his friend. And he turned again into the camp: but his servant Joshua, the son of Nun, a young man, departed not out of the tabernacle. 12 And Moses said unto the LORD, See, thou sayest unto me, Bring up this people: and thou hast not let me know whom thou wilt send with me. Yet thou hast said, I know thee by name, and thou hast also found grace in my sight. 13 Now therefore, I pray thee, if I have found grace in thy sight, shew me now thy way, that I may know thee, that I may find grace in thy sight: and consider that this nation is thy people. 14 And he said, My presence shall go with thee, and I will give thee rest. 15 And he said unto him, If thy presence go not with me, carry us not up hence. 16 For wherein shall it be known here that I and thy people have found grace in thy sight? is it not in that thou goest with us? so shall we be separated, I and thy people, from all the people that are upon the face of the earth. 17 And the LORD said unto Moses, I will do this thing also that thou hast spoken: for thou hast found grace in my sight, and I know thee by name. 18 And he said, I beseech thee, shew me thy glory. 19 And he said, I will make all my goodness pass before thee, and I will proclaim the name of the LORD before thee; and will be gracious to whom I will be gracious, and will shew mercy on whom I will shew mercy. 20 And he said, Thou canst not see my face: for there shall no man see me, and live. 21 And the LORD said, Behold, there is a place by me, and thou shalt stand upon a rock: 22 And it shall come to pass, while my glory passeth by, that I will put thee in a clift of the rock, and will cover thee with my hand while I pass by: 23 And I will take away mine hand, and thou shalt see my back parts: but my face shall not be seen. 4 And he hewed two tables of stone like unto the first; and Moses rose up early in the morning, and went up unto mount Sinai, as the LORD had commanded him, and took in his hand the two tables of stone. 5 And the LORD descended in the cloud, and stood with him there, and proclaimed the name of the LORD. 6 And the LORD passed by before him, and proclaimed, The LORD, The LORD God, merciful and gracious, longsuffering, and abundant in goodness and truth, 8 And Moses made haste, and bowed his head toward the earth, and worshipped. 1 Kings 19:3-9, 11-13, 15-16 3 And when he saw that, he arose, and went for his life, and came to Beersheba, which belongeth to Judah, and left his servant there. 4 But he himself went a day's journey into the wilderness, and came and sat down under a juniper tree: and he requested for himself that he might die; and said, It is enough; now, O LORD, take away my life; for I am not better than my fathers. 5 And as he lay and slept under a juniper tree, behold, then an angel touched him, and said unto him, Arise and eat. 6 And he looked, and, behold, there was a cake baken on the coals, and a cruse of water at his head. And he did eat and drink, and laid him down again. 7 And the angel of the LORD came again the second time, and touched him, and said, Arise and eat; because the journey is too great for thee. 8 And he arose, and did eat and drink, and went in the strength of that meat forty days and forty nights unto Horeb the mount of God. 9 And he came thither unto a cave, and lodged there; and, behold, the word of the LORD came to him, and he said unto him, What doest thou here, Elijah? 11 And he said, Go forth, and stand upon the mount before the LORD. And, behold, the LORD passed by, and a great and strong wind rent the mountains, and brake in pieces the rocks before the LORD; but the LORD was not in the wind: and after the wind an earthquake; but the LORD was not in the earthquake: 12 And after the earthquake a fire; but the LORD was not in the fire: and after the fire a still small voice. 13 And it was so, when Elijah heard it, that he wrapped his face in his mantle, and went out, and stood in the entering in of the cave. And, behold, there came a voice unto him, and said, What doest thou here, Elijah? 15 And the LORD said unto him, Go, return on thy way to the wilderness of Damascus: and when thou comest, anoint Hazael to be king over Syria: 16 And Jehu the son of Nimshi shalt thou anoint to be king over Israel: and Elisha the son of Shaphat of Abelmeholah shalt thou anoint to be prophet in thy room. You are currently browsing the archives for the Feasts Of the Savior category.